Image to PDF conversion software provides image or page setting such as page size, page margin and image size. Software support various picture formats such as JPG, PNG, GIF, TIF, BMP, JPEG, TIFF, EMF, WMF to PDF document. You can set page size by select paper size such as A0, A1, A2, A3, A4, A5, RA0, RA1, etc and customize height and width. It is advanced, cheapest and easy to use conversion software. Picture to PDF converter tool has transform various type of image, photo, picture, photograph, scan, still, snaps, screenshot, snapshot to Adobe PDF document. Software can directly convert scan paper to PDF file in a single click. You may set Meta properties such as author, title, subject and keywords. You can set image size as original size, fit to page and customize image by height and width. 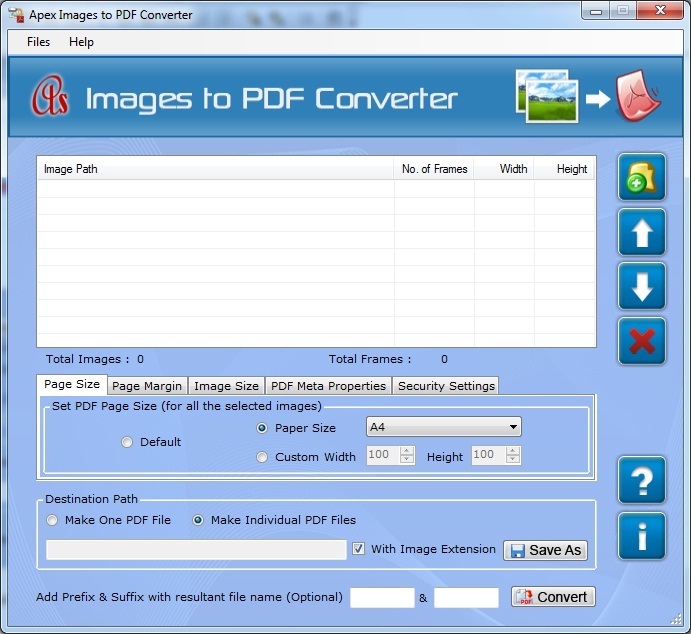 If you have convert easily multiple image format to PDF file download this software to go this link www.filesconversion.com Apex Images to PDF Converter and save your time. This software is successfully run to major windows operating system such as 98, 2000, 2003, NT, XP, Vista and 7. * Tool has option to join, merge, insert and create multiple images to single or individual PDF file..
* Software can directly convert multiple image, picture, photo, screenshot, snapshot to PDF document. * Software converts various image formats like PNG, GIF, TIF, BMP, JPEG, EMF, WMF to PDF document. * Conversion software provides to set page and image such as page size, page margin and image size. * You may set Meta properties such as author, title, subject and keywords. * You can select paper size like A0, A1, A2, A3, A4, A5, RA0, RA1, etc. * Software can simply design to batch conversion of image file into Adobe documents. * You can set page margin such as top, left and center. * It is standalone software does not need of Adobe Acrobat software.